Summary: A 90s throwback combined with brisk movement in the ongoing storylines is one of the most heavily stuffed but competent episodes of the show thus far. Barry and Joe continue their investigation into Wells, with both of them heavily suspecting that Wells is the Reverse-Flash. 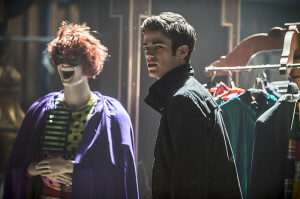 A copycat killer who goes by the name “The Trickster” starts setting off bombs in Central City. In order to stop the villain, Barry and Joe meet with the original Trickster, a criminal mastermind named James Jesse , who has been imprisoned for 20 years. Things quickly go from bad to worse when they realize the two Tricksters are working together — Jesse is the new Trickster’s father — and the endgame was the break Jesse out of prison. The two unite and take Henry prisoner, then poison a crowd at Mayor Bellows’ fundraiser. Flash has to save them even with a bomb strapped to him; Wells helps Barry learn to pass through a wall to knock the bomb off, which confirms Barry’s suspicions that Wells is a speedster. Flash is able to administer an antidote to everyone and stops the Tricksters. Upon rescuing his father, Barry reveals his identity to Henry, and shows him STAR Labs before escorting him back to prison. 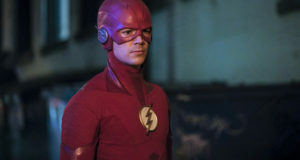 Barry and Joe decide to get help from Eddie in their investigation, and reveal Flash’s identity to him. In the flashbacks, we learn that Eobard Thawne was a different being from Harrison Wells, the latter of whom really was building a particle accelerator with Tess Morgan. However, it wasn’t going to be completed until 2020, so Thawne stole Wells’ appearance before killing him and Tess to take over his life and change the timeline to suit his own needs. Much like “Crazy For You,” there are so many different threads that it’s going to be easier to break them down into categories. But while the former was a weaker installment because of that, “Tricksters” manages to build something much more cohesive out of all the parts, if only because it plows so quickly through its material. If anything, this Trickster business pays tribute to a former era of superheroes in television. There’s something to be said about the ballsiness of comic book shows in the late 80s and early 90s, before shows like Smallville started being able to use CGI effects a bit more competently. Shows like The Flash, Lois & Clark, and the TV movie sequels to The Incredible Hulk series attempted to capture high-concept comics craziness on an impossible budget, but still retained the “adult” attitudes and production seriousness of the 70s superheroes series and films. It’s not too different from where superhero shows are now, really, we just have better technology and more welcoming networks than back then. It’s a worthy tribute, then, to have someone who found a resurgence in his career from 90s era supervillains in a prominent role. Mark Hamill’s Trickster is darker than his original version, less loony and more akin to the more menacing Joker role Hamill has voiced for over a decade. That’s fine, though, because Hamill’s villain voice is so unique and iconic that it’s just a joy hearing it with a live action face. Hamill is great in that aspect too, reveling in the role and reflecting that in his body language. The episode has fun with the darker Hannibal Lector role for James Jesse for a bit, but very quickly shifts gears and lets Hamill be a little more goofy once he escapes. There are plenty of funny one-liners from Hamill, not to mention a signature quirky sweet tooth, but all the bombs and chaotic flair from Trickster and his son as silly and scary as expected. Oh, right — new Trickster is old Trickster’s son, and in a stunning morsel of fanservice, Mark Hamill says “I am your father.” That entire story beat seems completely orchestrated around having that line, and it’s about as anvilicous as you could get. But even the most cynical of geeks should be able to get behind this, especially considering every party involved was obviously into the idea. That son is decent enough for the young Trickster, with some carefully placed details to update him for our time. The constant selfie-posed videos of the wrongdoing totally work, and even the weird punkish costume update makes sense as an analogue for the very 90s-looking original mismatched color costume. Devon Graye seems to have full understanding of the role he plays too, but is hindered by far too little screentime for us to get a full grasp on his purposefully over-the-top character. Graye’s Trickster is a walking Macguffin to get all the more interesting players involved, and he suffers for it. But even as the weakest part of the episode, he shows promise for a return appearance, with or without his dad. Barry and his three dads: The other big tribute this week comes from Henry Allen, of course played by John Wesley Shipp of the original The Flash. The show resists the temptation for being too on-the-nose — we could have said Henry was the cop who captured the Trickster, after all — and settles for a couple of scenes between Shipp and Allen where they barely interact. That they don’t get more banter is a little disappointing, but it leads into a much more pleasant and satisfying passing of the torch between new and old Flashes. There’s a distinct father and son theme in the Trickster storyline, but the brief material between Barry and his father is the most emotionally affecting of the episode. It’s been pretty clear that Henry figured out his son’s identity a while ago, but allowing him to visit STAR Labs and see the whole of his heroic son’s world is very sweet. That makes it more painful when Henry essentially gives his blessing to Harrison Wells as a father figure, amidst and Barry and Joe’s investigation. 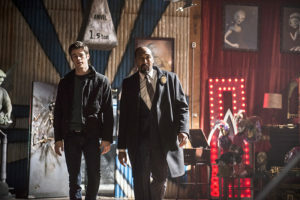 Teaming up Barry and Joe for this investigation is great, because the relationship between the two is one of the best relationships on the show. 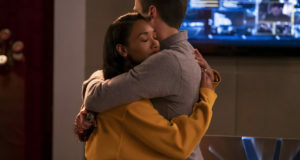 Grant Gustin gets to play Barry far more serious than normal given the personal nature of the betrayal, which lets Jesse L. Martin play Joe as inherently more comforting, sensible, and even lighthearted, which is where the chemistry between the two flourishes. The scene between the two in the particle accelerator room is a stand-out, especially as Joe hammers in the necessity of Barry’s optimism, a good reflection on both the character and the show as a whole. Harrison Wells and Eobard Thawne: Just when we thought we had it all figured out, the show throws a curve ball yet again. Like the uncertainty of the midseason finale’s reveal teased, things haven’t been as straightforward as we thought. On one hand, we now know how Harrison Wells had a tragic backstory and why his blood wasn’t present at Barry’s mother’s murder. We know why Wells was chosen for Eobard’s plans. We roughly know what he’s planning and his motivation, at least to an extent. Funny thing is, even with just about every obvious question answered, there’s still a lot of questions beneath. That, though, is a good thing; this isn’t the frustrating mystery storytelling shows like X-Files or Lost have collapsed under. 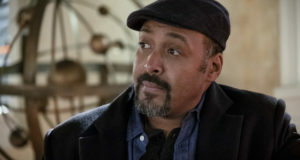 The Flash has, at least right now, capably teased enough over its long season while still providing answers relatively quickly, so that when more questions arise, it doesn’t feel like an unfair trade-off. The answers we’ve gotten have been satisfying, and the questions we’re getting in return are justified. 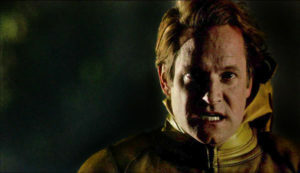 Matt Letscher is a fine choice for the real (as far as we know) Eobard Thawne, even if we won’t see much of him. Letscher demanded a fun presence as the slimy Billy Chambers in Scandal, pretty much the Big Bad of the early days, so he’s proven how he can bring some weight to a potentially cartoonish villain. The sad thing about the reveal, though, is that it leaves slim chance for a regular character return from Tom Cavanaugh. At first, it seemed as though the show was giving itself an out; perhaps Eobard simply switched bodies with Wells, or Wells would still be alive, or maybe they’d merge a la Firestorm. But nope — Wells’ essense is explicitly and violently sucked out, in a way akin to the early shapeshifters on Fringe. It’s about the most nightmare fuel-inducing thing The Flash has done, and unless Barry saves the old Wells via time travel, it looks like Cavanaugh will only ever be back as his Thawne iteration, which would probably not be in a series regular status. Even still, “Tricksters” is an exceptionally competent and ballsy episode, a would-be one-off gimmick episode that, instead, might be one of the most imperative of the season. This episode combines the best of both worlds, including the kitschy goodness and fun of 90s-era hero shows, with the fast-paced and complex storytelling of shows now. 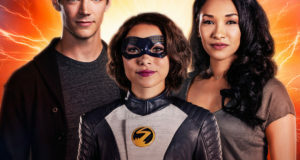 After a lackluster outing last week, “Tricksters” has The Flash not just back in full-form, but on a higher, even if more manic and somewhat chaotic level. Vito D’Ambrosio also reprises his role as Bellows, of the endlessly fun Murphy and Bellows comic duo of the 90s The Flash. Instead of being a young, earnest policeman, Bellows is now the mayor. Nice to see the guy moving up, since he and Murphy were some of the best parts of the original show. Serious pet peeve: little kids on TV who witness horrible things happening and just stand there frozen in wonder. It makes a little more sense this time, I guess, since the bombs are made to look like toys. But still…kids aren’t that dumb. Love the chimey Trickster theme music motif. 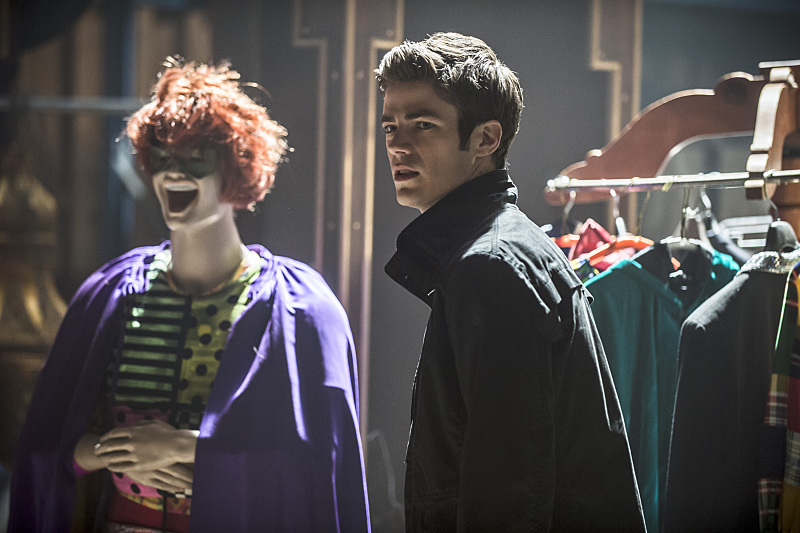 Not sure why Flash running through a wall would leave the bomb on the other side, but not his costume. Suspension of disbelief, ahoy! So, Thawne changes time so that the particle accelerator would be completed sooner…but it only comes about five or six years sooner. Maybe the idea isn’t to get the machine itself built sooner, but to do it at the perfect time that would give Barry powers? And is his endgame to steal Barry’s powers or use his place in the Speed Force or what? It’s still hard to nail exactly what his plan is, even in spite of everything we know. Of course a tribute to the 90s would reference Speed, a movie so quintessentially 90s. I was going to make a snarky comment about Iris still having a key to Jitters, but then I remember I still have a key to the old office I worked about about three years ago…so, I guess it does happen. The attendants’ reactions in the fundraiser scene that the Tricksters take hostage of are…unusually bad. When the Tricksters first appear, people have a really muted “Who?” reaction to a couple of well-known terrorists. And when they reveal everyone has been poisoned, many of the people just look kind of annoyed rather than terrified for their lives. Cisco mentions a “Felicity-level scrambler,” in a fun cross-show reference. “My masterpiece, my Mona Lisa, my Breaking Bad season 5.” – Well, I think most would argue that season 3 or 4 was the real pinnacle of the show, but…I’ll take it. “That wasn’t very sanitary!” – Trickster has a very good point when Barry injects everyone with a cure from the same needle.